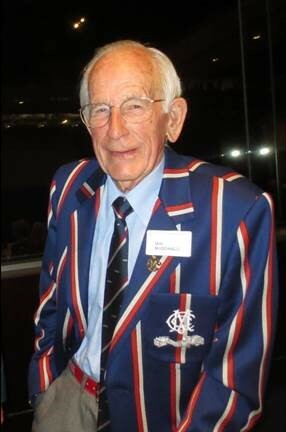 Cricket Victoria has learned of the sad passing of former State player Dr Ian McDonald last Monday night, aged 95. Dr Ian McDonald played 39 first class matches for Victoria and one for an Australian XI against South Africa in Sydney between 1948-49 and 1952-53, scoring 843 runs at 16.86 and capturing 131 dismissals (78 ct/53 st). His highest score was 54. He also played 127 District matches for Melbourne (64) and University (63) from 1942-43 until 1956-57, scoring 1679 runs at 16.95 with 6 half-centuries and a top score of 80. In all District matches he effected 192 dismissals (103 ct/89 st). Dr McDonald was a member of Melbourne's 1948-49 and 1951-52 premiership teams. He was the older brother of former Australian Test opener Colin McDonald. Dr McDonald was an MCC member for an incredible 79 years. He was awarded the prestigious Ebeling Award in 1986 for his outstanding service to cricket and hockey and MCC Honorary Life Membership in 2000. He was a co-founder of the MCC XXIX Club in 1956, served as XXIX Club President from 1959-1962 and was a Life Member of both the XXIX Club and the MCC Hockey Section. Dr McDonald served on the MCC Committee between 1958 and 1968 and was also an MCC Guide. Cricket Victoria extends deepest condolences to the McDonald family and the Melbourne Cricket Club.